I have a few minutes this Christmas evening and thought I'd blog about the first two parts of our Christmas celebration. Yes, Christmas has only begun at our house. We've had two celebrations and we have two more. 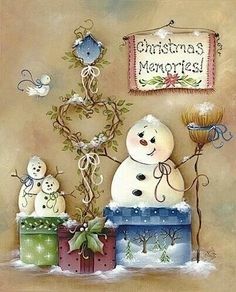 My two brothers will arrive this weekend and then we will not have Christmas with our children until next Tuesday night. It is going to be a very long Christmas celebration for sure! So to avoid a lengthy recap I thought I'd share our Christmas Eve and Christmas Day events today. Note: this is my 700th post! That's a whole lot of writing folks and I can honestly say I've enjoyed every minute of it! On Christmas Eve our son, DIL and the Princess joined us in having Christmas with my Dad. We had a nice dinner and then he opened his presents. 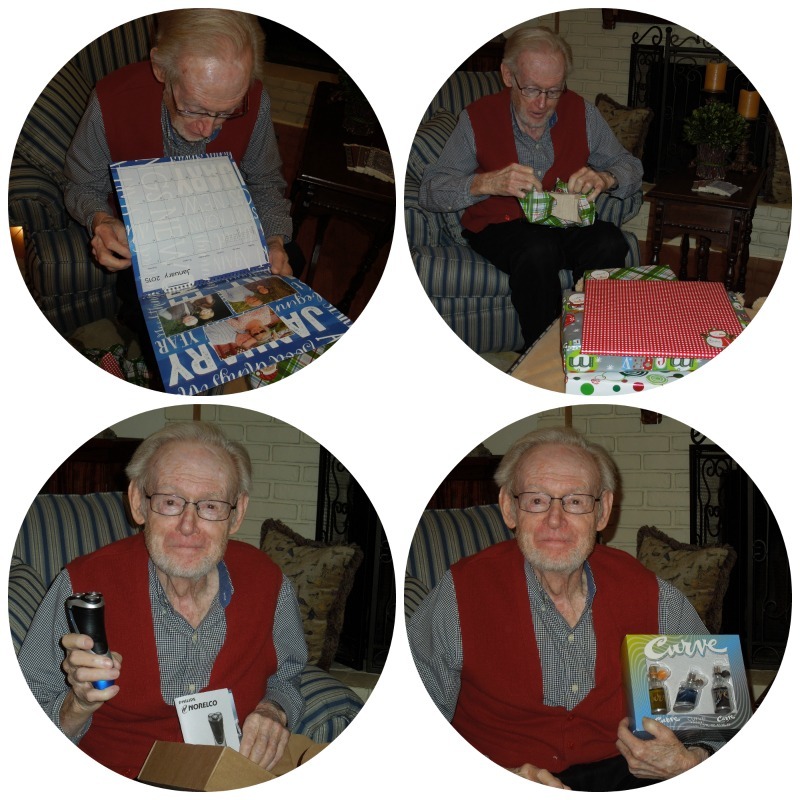 He was quite thrilled with his new razor and an array of cologne. 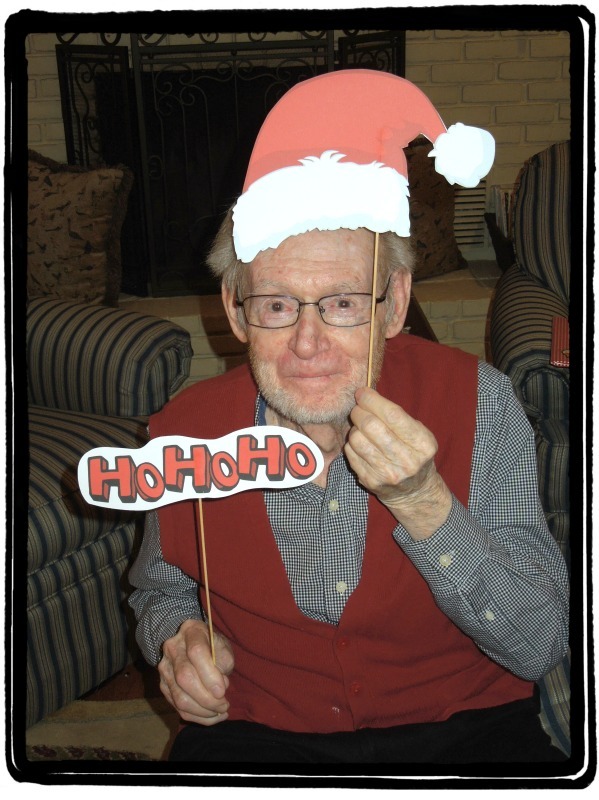 He thoroughly enjoyed the evening and I would say it is the best he has felt for Christmas since he got sick 3 years ago. It was great to see him enjoying the celebration. 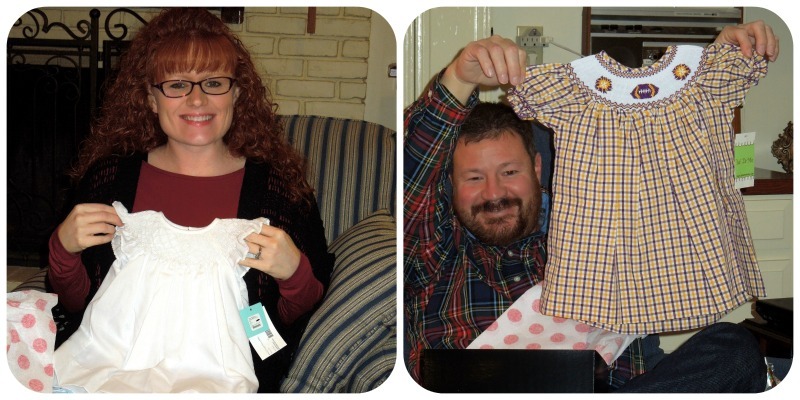 I had picked up a few outfits for our little sweetheart, to be born in mid-February, and thought it would be fun to give those to her Mom and Dad during our Christmas Eve celebration. The little LSU smocked dress was quite a "hit" with her Daddy! It was a fun Christmas Eve! Yesterday we joined some dear friends for a mid-afternoon meal as we both were going to be by ourselves for the day. You must know that this gal is extraordinaire in everything she does. Below is a picture of the dining table that we were privileged to sit down and eat at. I felt very queenly for sure! Each place setting beautifully done. A gorgeous tree graces one corner of the dining room. The buffet was elegant with the three wise men and greenery. A beautiful nativity on the foyer table. It was fun to share a part of our Christmas day with dear friends. Things are moving right along once again. 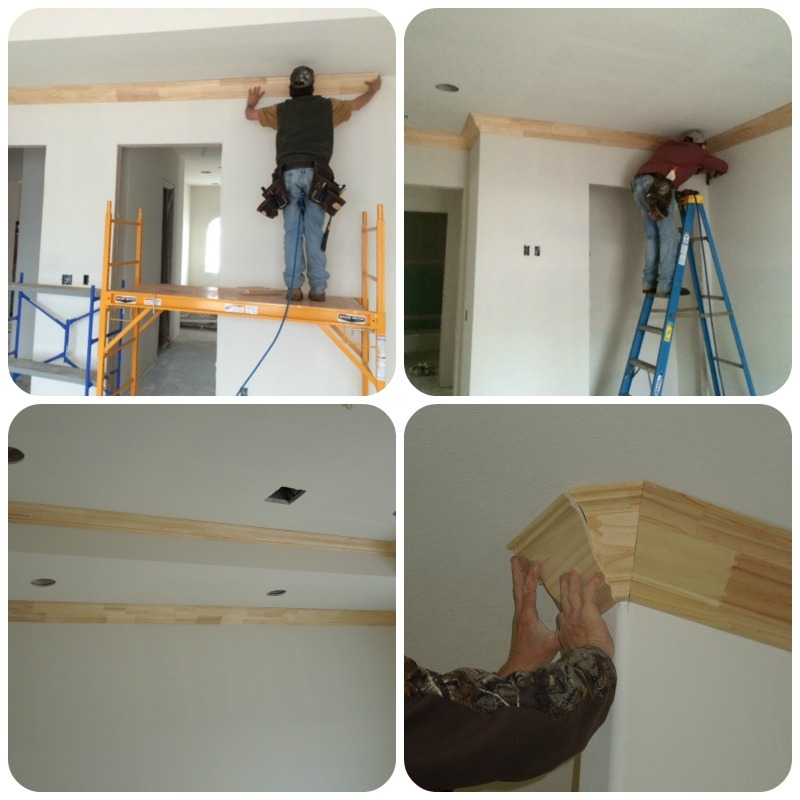 They started the trim work this week and a couple of the guys even worked a part of Christmas Eve and Christmas Day. The cabinets will start going in on Monday. It's coming together and looking so good. We've still got a long way to go, but we're definitely getting there. Wow, cabinets already? It'll really start to look like a home then, won't it? Do you have a tentative moving day yet? What a way to spread out the Christmas season. Loved the little girly dresses for the new princess. Would also like to know whose house that is. Thought of a couple but dismissed it, but decided it might be Kathy M. Nothing like a guessing game😊. The house is indeed coming along nicely. Now, Happy New to you! Spreading out the celebrations works well doesn't it? Glad all is going well. Your dad looked like he was enjoying his, and looked quite cute. The house is getting closer and closer and looks good...soo exciting. Enjoy the rest of your celebrations! Glad your dad was enjoying Christmas! Looks like the house is coming along nicely. Have a very Happy New Year! Your Christmas decorations are beautiful! The Nativity vignettes are especially well-done. Your dad looks great. It looks like you had a wonderful time! Thanks for sharing your beautiful photos! The molding is beautiful, your home is going to be lovely. What fun celebrations you had and I hope the others were just as special. Love your tree and the camels are so beautiful along with the nativity. It sounds like you are quite busy this Christmas. I loved seeing all the photos, especially your happy dad. I love nativity scenes and your friend certainly had her share of them in her beautifully decorated home. And speaking or writing of homes ...yours is looking good. I'm sure you can't wait until it's finished and you're all moved in. 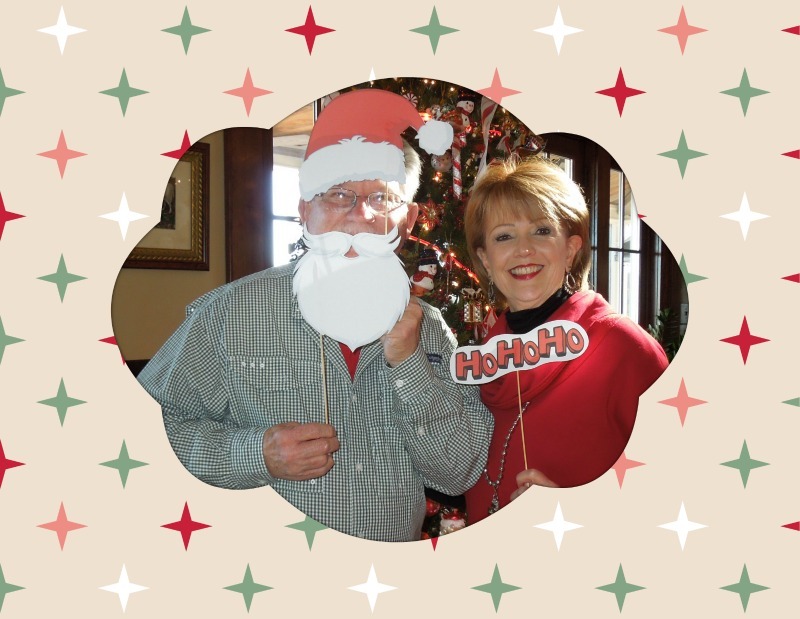 Holiday FUN and a Merry Christmas to YOU!